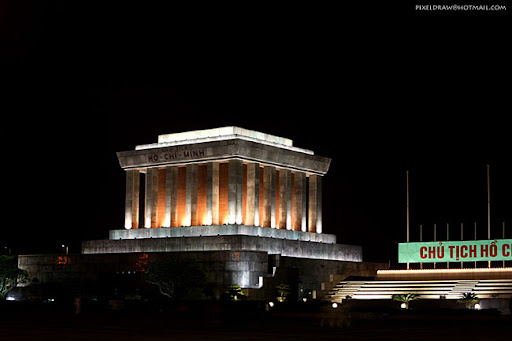 8:00 AM, tour guide and driver will come to pick up at hotel, then start driving along Hanoi Old Quarter to visit Ho Chi Minh Mausoleum and Museum. Enjoy the architectural and historical aspects of Uncle Ho's final resting-place. Just next door is Ho Chi Minh's house on stilts. Lying to one side of the Mausoleum is the One Pillar Pagoda, founded by King Ly Thai To in 1049 the structure has become an important symbol for the people of Hanoi. Continue to visit the Quan Thanh Temple (Taoist, dating from the Ly Dynasty) and Buddhist Tran Quoc Pagoda on West Lake (One of the oldest in Vietnam ). Next, we will enjoy lunch time at a restaurant before continue to visit the Ethnology Museum, and then head to the Literature Temple and Quoc Tu Giam. Vietnam's first university constructed in 1070, it's gardens and well-preserved architecture offers a relaxing glimpse into Vietnam's past. Fianlly, back Ngoc Son Temple for enjoying Hoan Kiem Lake with overview. Leisure and end services. Included: Private Car A/C,English-speaking guide,small lunch,and entrance fee. Pickup from Noi Bai Airport(In Hanoi city) in the morning when you arrive before 11.00am,you can visit Hanoi city before you go to your hotel in Hanoi old area for checkin .The cost will be charged extra for 1pax : 10 $USD/1pax.